Shepherd Neame pub in Mayfair (corner of Hill Street and Hay's Mews). Note that it's not open on weekends, like many pubs in the area. 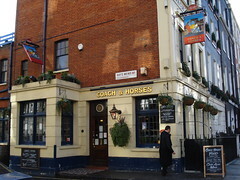 It's a fairly small one-room pub with traditional decor; carpeted floor, brass footrail around the bar, and banquette seating plus upright chairs and stools with matching upholstered seats. The dark wood of the square varnished tables is matched by the panelling covering the lower half of the walls. Kake et al. first visited on a Thursday evening in May 2007. It filled up with suits (mostly men, but a few women too) around 6pm, and emptied out gradually over the evening; we were the only people left when last orders were called. The lighting was rather dim, which wasn't a huge problem in itself, but it did mean that the strip lighting shining into our eyes from behind the bar was rather unpleasant. We tried the (fairly standard pub) food on this occasion. Steak, mushroom, and stout pie and chicken, leek, and mushroom pie (both £6 as of May 2007) were proper pies, with shortcrust pastry all the way around. Sausages and mash with onion gravy was generally satisfying, with acceptably meaty sausages but a rather flavourless gravy. The mash was proper mash, with lumps in. They ran out of steak pies around 7:30pm, and then ran out of chicken pies 15 minutes later. Kake visited again on a Thursday afternoon/early evening in July 2009. Two ales were available — Spitfire and Kent's Best (£3.20/pint). They also had Asahi and Orangeboom on top. Lime and soda was £1.10/pint. Service was friendly. Tennis was playing silently on the flatscreen, and piped music was playing very quietly in the background. The place was about half-full when I arrived around 4pm, then became entirely full when about 20 people arrived all at once just after 5pm. Most people were standing though (both inside and outside) so there were still free tables. Last visited by Kake, 2 July 2009. Opening hours taken from sign on door, July 2009. Food prices taken from menu in pub, 10 May 2007. Last edited 2013-05-10 06:57:20 (version 18; diff). List all versions. Page last edited 2013-05-10 06:57:20 (version 18).